When I go here and check out the song Waters and Oceans by The Broken Beats, I close my eyes and see Elbow and Doves performing on stage together…. In my musical journey around the world, through the Internet (that I call ‘research’) I once again land in Denmark. Great music going on here from what I can tell. 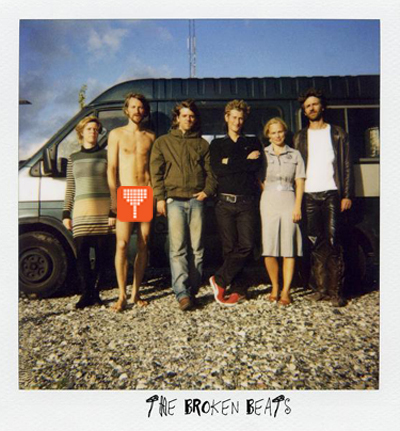 This band in particular, The Broken Beats are a 7-piece fronted by the charismatic Kim Munk (the naked guy below, had to throw my logo on there before anyone saw too much on my site). If you check the stats on their myspace page, you find that most people enjoy the song L’Essential. I don’t think the falsetto really works for me…. On the other hand, I dug Black Fire, made me think of Muse. **All songs there are off In The Ruin For The Perfect. Check out the video for Copy, download the track here. Dandy Warhols maybe?